Air baths provide a different type of massage than a whirlpool bath; it’s a non-aggressive soft tissue massage. The soft massage of an air bath is provided by millions of heated air bubbles that contact the skin after they are released from air injectors, air that is provided by a heated air blower. An air message soothes the body, boosts cardiac output, opens pores and improves circulation. Virtually flush with the tub floor. The slim-line Injector covers provide 7 air ports per injector. Internal check valve keeps water out of the air system, insuring a clean and dry system. Air injectors with integral watertight check valves, valves open and close when blower is turned on or off. Water never enters any part of the air system. Each injector has 7 air ports. Injectors can be serviced from inside the tub. Air manifold with integral watertight check valve provides each injector with the same air pressure. Manifold's check valve also provides secondary protection for the blower should an injector malfunction. PVC air lines carry air from manifold to each injector insuring peak performance. Air lines stay clean, dry and hygienic, unlike air channel systems with drilled holes. Heated 1 h.p. variable speed blower has a lifetime warranty. The ONLY manufacturer that reinforces the tubs floor with steel and provides a steel blower mounting platform. All models compliant with UL and National Plumbing and Electrical Codes. No injectors - just holes with no check valves drilled through tub into air channels. Water fills the entire air channel while the tub is filling or blower is off. 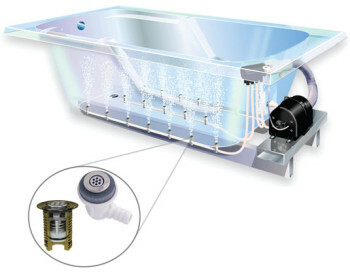 Air channels retain water between baths and never drain completely or dry out. Air channels become unsanitary because the blower purge cycle can’t remove all the water that enters the air channels after the blower is turned off. 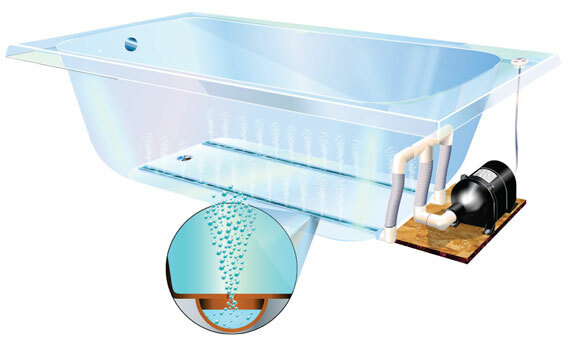 Air channels are fiber glassed into the tub’s bottom, and are not serviceable or cleanable. No manifolds with check valves. The Hartf ord Loop System is an ineffective and outdated technique to try to prevent water from reaching the blower. Limited blower warranty, blowers are not variable speed, and often have no heater. No custom blower locations offered. Tub floor and blower mounting platform are wood. Provide no structural support and can vibrate and flex leading to leaks, noise, and other problems. No option of adding or moving injectors.